• One stamp per ramen order, per customrer. • Please present the card when paying for your meal. 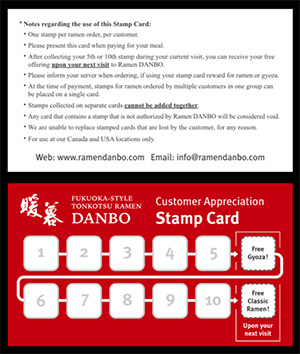 • After collecting your 5th or 10th stamp during your current visit, you can receive your free offering upon your next visit to Ramen DANBO. • Please inform your server when ordering, if using your stamp reward for ramen or gyoza. • At the time of payment, stamps for ramen ordered by multiple customers in one group can be placed on a single card. • Stamps collected on separate cards cannot be added together. • Any card that contains a stamp that is not authorized by Ramen DANBO will be considered void. • We are unable to replace stamped cards that are lost by the customer, for any reason. • For use at our Canada and USA locations only. You may continue to use previously issued Stamp Cards. Please note that these rules apply to new Stamp Cards, as well as all previous editions.